Knype is the name Arnold Bennett gave to the Potteries town of Stoke-upon-Trent in his Five Town novels. "Edwin and Janet stood together on the windy and bleak down-platform of Knype Station, awaiting the express, which had been signalled. Edwin was undoubtedly very nervous and constrained, and it seemed to him that Janet's demeanour lacked naturalness. Then the train appeared, obscure round the curve, and bore down formidable and dark upon them, growing at every instant in stature and in noise until it deafened and seemed to fill the station; and the platform was suddenly in an uproar." Bennett made use of the Potteries loop line that during the late 19th century provided a much needed form of transport between the towns. The loop line emanated at Stoke Station. "In a second-class compartment of the Loop Line train with Sophia and Fossette opposite to her, Constance had leisure to 'take in' Sophia. "Well I never!" cried Sophia, suddenly. She had glanced out of the window and had seen two camels and an elephant in a field close to the line, amid manufactories and warehouses and advertisements of soap. "Oh!" said Constance. "That's Barnum's, you know. Hey have what they call a central depot here, because it's the middle of England." Constance spoke proudly. Sophia hit on the excellent idea of noting all the buildings that were new to her and all the landmarks that she remembered. It was surprising how little the district had altered. "Same smoke!" said Sophia. "Same smoke!" Constance agreed. "It's even worse" said Sophia. As the train puffed under Trafalgar Road, Constance pointed to a new station that was being built there, to be called 'Trafalgar Road' station. " Won't it be strange?" she said, accustomed to the eternal sequence of Loop Line stations - Turnhill, Bursley, Bleakridge, Hanbridge, Cauldon, Knype Trent Vale and Longshaw. A 'Trafalgar Road' inserting itself between Bleakridge and Handbridge seemed to her excessively curious. She indicated the glories of Bursley Park, as the train slackened for Bursley, with modesty. " 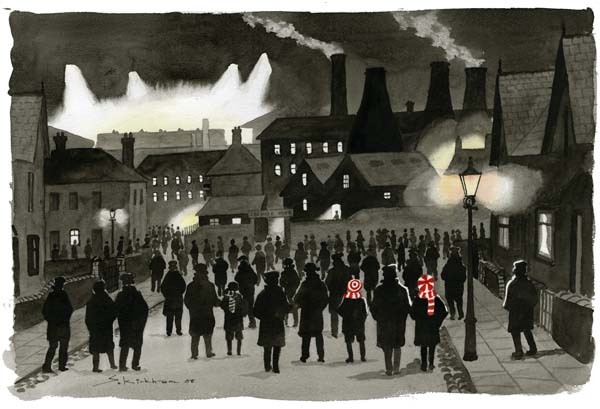 Stoke City Football Club dates back to 1863 and is the second oldest association club in the country. The former "Victoria ground" in Boothen Old Road, produced 31 internationals, including the great Sir Stanley Mathews. Arnold Bennett exploited the adherence of loyalty that's come to symbolise the almost fanatical support the club enjoys from its supporters, in the jovial novel "The Card." "There were two "great" football clubs in the Five Towns - Knype, one of the oldest clubs in England, and Bursley. Both were in the League, though Knype was in the first division, whilst Bursley was only in the second. Both were, in fact, limited companies, engaged as much in the pursuit of dividends, as in the practice of the ancient and glorious sport which appeals to the reason and the heart of England. Neither ever paid a dividend. Both employed professionals, who, by a strange chance, were nearly all born in Scotland ; and both also employed trainers who, before an important match, took the teams off to a hydropathic establishment far, far distant from any public house. This was called training. Now, whereas the Knype Club was struggling along fairly well, the Bursley had come to the end of its resources. The great football public had practically deserted it. The explanation, of course, was that Bursley had been losing too many matches." "Grown men no longer play at marbles, as they used to when I went to school. Of the more ancient diversions, pigeon-flying alone remains a very harmless hobby. Football alone reigns supreme and has no serious rival. The potteries was one of the first centres of football, and in the history of the Association game, the name Stoke on Trent is glorious. Football has the characteristics of force and violence and spectacular bigness which could not fail to attract a race as the potters. Cricket is much practiced, and golf waxes yearly, but there is nothing like football in North Staffordshire."